The 800 Europa Series has been developed to comply with the EN-1143/1 European standard for safes. These models have been tested and certified by Aenor and Applus and have been awarded Grades III, IV and V. Our manufacturing process has been certified by Aenor and Applus, guaranteeing that the delivered product has the same construction features as the tested one. Each grade has a different armour, made up by high resistant composite materials, with metallic fibres, which provide them with great mechanical and thermal resistance. The wall thickness is 80 mm. The door thickness is 150 mm, including the closing system. The armour thickness is 80 mm. The door is put up through a pivoting double hinge joint on two shafts with autolubricated bearings, what allows the door to open 180º. On the hinges side, a tongue and groove linear outline against removal stops its opening in case of a lateral or hinges attack, blocking the whole door (upper, lateral and lower parts) with mobile bolts. 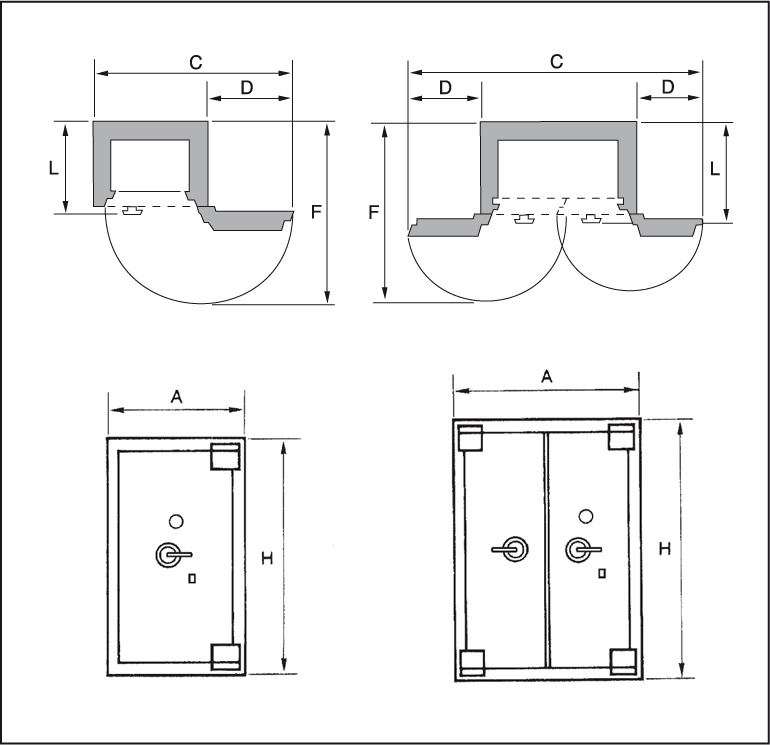 The closing mechanisms are distributed throughout the surface of the door and operate individually on powerful cylindrical bolts of Ø 30 mm (40 mm for model CF-880). The number of the bolts varies according to the grade and model of the safe. Anti-drilling protection of the sensitive zones of the mechanisms, bolts, reblockers and locks. There is an additional protection on the lock, based on a security tempered glass. In the event of an attack, several automatic re-locking systems condemn all the locking devices. All the internal and external surfaces of our safes are protected with antirust primers and paint. The safes can be covered with wood or leather. All models of the 800 Europa Series Safes can be delivered to be built-in on site. (*) External depth + handle. I consent to the use of my personal data to receive advertisements from your company.